No matter what you understand about snoring; it can be an irritating nuisance. Snoring can also be explained as breathing during sleep with hoarse or rattling sounds caused by the vibration of the soft palate or as breathing through the mouth and nose during sleep and making snorting sounds caused by vibrations of the soft palate. So it is the sounds that a person makes during sleep that are understood as snoring. There is more to it though, it is also necessary to explain why the sounds are made in the first place. Snoring will happen when airflow is blocked because of an obstruction or when the airways become narrow, causing the rumbling sounds. As you breathe in, the walls of the throat begin to vibrate. The more constricted or narrow the airway, the greater the vibration will be and the louder the snoring will be. The sound therefore comes from the vibration of the soft palate, uvula, tonsils, and other tissues in the mouth, nose and throat; as air flows over them during sleep. Some people can be nasal snorers, tongue based snorers, or mouth snorers (palatal snorers), and even a combination of these. Read my article; Types of Snoring, for more on this. Sometimes the walls of the throat collapse completely or are almost completely constricted and narrow, which creates a condition called Obstructive Sleep Apnea (OSA). This is a serious condition that should not be ignored, see your doctor if your suspect OSA. Medical studies also found that snoring chronically could lead to other serious health conditions, such as diabetes and high blood pressure. 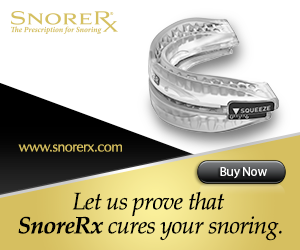 Snoring has also been found as a contributor to marital problems, and breakups. It is estimated that about half of all adults snore. So don’t feel bad, half of everyone in your next staff meeting snores; even your boss. It is also estimated that almost 25% of all adults snore chronically, in other words, they snore 3 or more days per week, every week. This figure even increases significantly as people age. The definition of snoring can now be summarized as; to make a hoarse rattling or grunting noise in breathing during sleep because of the narrowing of the airways and the vibration of the soft palate and other tissues in the mouth, noise and throat.